Reverend Michael Walker (at Hymers 1950 – 1958) visited on Thursday 28th September. After travelling to Hull to visit The Deep, Michael decided to stop off at his old school for a tour. He last visited Hymers over 10 years ago for a reunion. Peter (at Hymers 1959 – 1969) and Christopher (at Hymers 1950 – 1960) Wilson visited the college on Friday 24th November. on Friday 24th November. Peter and Christopher initially visited to donate their grandfather’s (C.C Wilson) high jump trophy to the school archives and decided to take the opportunity to have a look around. The trophy was won in 1899, making C.C Wilson amongst our very first wave of pupils at the school. Peter Carr (at Hymers 1949 – 1957) visited us on Tuesday 7th November from New Zealand. school. 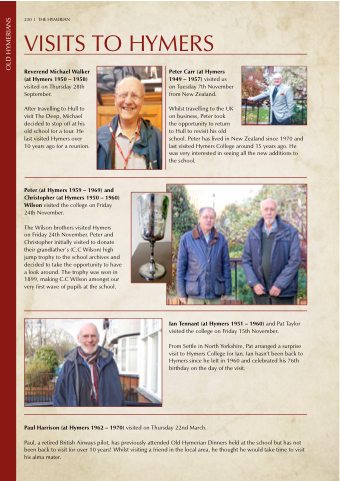 Peter has lived in New Zealand since 1970 and last visited Hymers College around 15 years ago. He was very interested in seeing all the new additions to the school. Paul Harrison (at Hymers 1962 – 1970) visited on Thursday 22nd March. Paul, a retired British Airways pilot, has previously attended Old Hymerian Dinners held at the school but has not been back to visit for over 10 years! Whilst visiting a friend in the local area, he thought he would take time to visit his alma mater. Ian Tennant (at Hymers 1951 – 1960) and Pat Taylor visited the college on Friday 15th November. From Settle in North Yorkshire, Pat arranged a surprise visit to Hymers College for Ian. Ian hasn’t been back to Hymers since he left in 1960 and celebrated his 76th birthday on the day of the visit.